Steve Harvey: A Comedy King Looks To Speak Across A Cultural Divide Steve Harvey is a sitcom star, an accomplished comedian and a best-selling author. But that doesn't mean there aren't plenty of people who have never heard of him. Entertainer and relationship guru Steve Harvey signs copies of his new book, Straight Talk, No Chaser: How to Find, Keep, and Understand a Man, at the Borders on 18th Street in Washington, D.C., on Thursday, Jan. 19, 2011. The explosion of Internet outlets and TV channels means it's harder for any one star to break through to everyone. 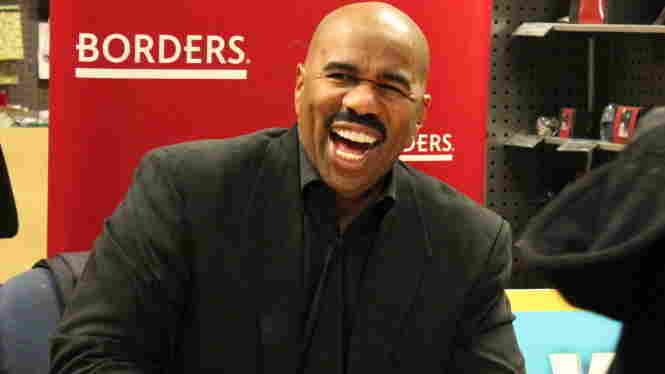 But Steve Harvey is doing his damnedest. Harvey's audience numbers 7 million for his nationally syndicated radio/TV show, which airs in 64 markets around the country. His first relationship how-to book, Act Like A Lady, Think Like A Man, sold 2.5 million copies. His second, Straight Talk No Chaser, has been a Top 10 New York Times bestseller since its release six weeks ago. Harvey hosts the game show Family Feud. (He's credited with boosting its ratings almost 40 percent since joining the show last fall.) And — oh yeah — he's a formidable stand-up comedian, featured in the 2000 Spike Lee documentary The Original Kings of Comedy, who's also starred in two sitcoms, including one that ran for six years. So how come millions of people have never heard of him? In part because our culture has become profoundly fractionalized since the advent of hundreds of cable channels, inward-gazing Internet communities and rigidly specific niche marketing. Harvey says he believes it's practically impossible to imagine any comedian these days accomplishing the reach Bill Cosby had with The Cosby Show, for example, or a musician selling as many albums as Michael Jackson. There is just so much out there that it's impossible to be familiar with all of it. He's had to fight that reality in his current career — even in his own cultural consumption. Take movies. When I went to see him a couple of weeks ago, he plugged a movie I wasn't very familiar with: Burning Palms, starring Zoe Saldana, of Avatar. Then I asked him during our interview about The King's Speech, because Harvey struggled with a debilitating stutter as a child. But Harvey hadn't heard of The King's Speech. This relatively major star was fascinated to learn about this relatively major movie. But then 25 years ago, there were barely 200 movies released every year, and everyone in media and entertainment would have heard of the short-listed likely Best Picture nominees. (In fact The King's Speech took 12 nominations when they were announced Jan. 25.) Last year, there were more than 500 movies in theaters. Plus, Harvey had a good excuse. He works so hard, he said, he hadn't managed to see a film in theaters in years, with one huge exception: The week before, he'd taken his wife to see True Grit at a theater in Atlanta, where he lives. Harvey started doing stand up when he was 27. Now, he's 54. For years, he ground out gigs in clubs across the United States. "If you name me the city I can tell you how to get there," he offered — and did, in spectacular fashion. But Harvey's had more trouble finding a road map to a multiracial fan base. His WB sitcom, The Steve Harvey Show, got decent ratings and earned NAACP awards, but it never found Cosby-like traction beyond black audiences. When he got a book deal based on the relationship advice he gives during his show, his publishers tried to keep him in that niche. "They were convinced at HarperCollins that [Act Like A Lady, Think Like A Man] was for black women, and when I sent the book in, they were putting stuff in it like, 'Sisters, let me tell y'all, black women got to stay together!' Whoa. I didn't say that. Take all that out." Men are men and women are women, says Harvey, so his books are for everyone. "I think he does a fabulous job of getting people talking," says Tonya Ladipo, a psychotherapist with a mostly black and African-American clientele. She's been surprised by how often her appointments start with the question: "Did you hear Steve Harvey's show this morning?" That's their in, a way to start talking about their problems. Ladipo doesn't always agree with Harvey's advice — take him as a comedian, not a mental health professional, she says. And at a moment when relationship success is critical to Steve Harvey's brand, his second ex-wife has been publicly furious about their divorce, lambasting him on social media. "Hey man, I got a divorce," he said recently on his show. "Hey man, I stepped out on my girl." But then Harvey started talking about his upcoming national tour with Kirk Franklin, one of gospel's biggest stars. He calls it the Ain't Nobody Perfect Tour. Harvey promised his on-air sidekicks that the tour would make them laugh — not chuckle. "A laugh is when you hit the people you roll with," he said. In a fragmented media culture, that's pretty much the definition of success.